The total height is 15.75” and the width is 26 1/2”. It has side mounting flanges and is designed to be mounted horizontally on a downflow style radiator. Total depth at the fan motor is 3.80" which includes the shroud and fan combined. Combined CFM of both 11" fans is 2800 CFM. Total amperage draw is 22 amps. 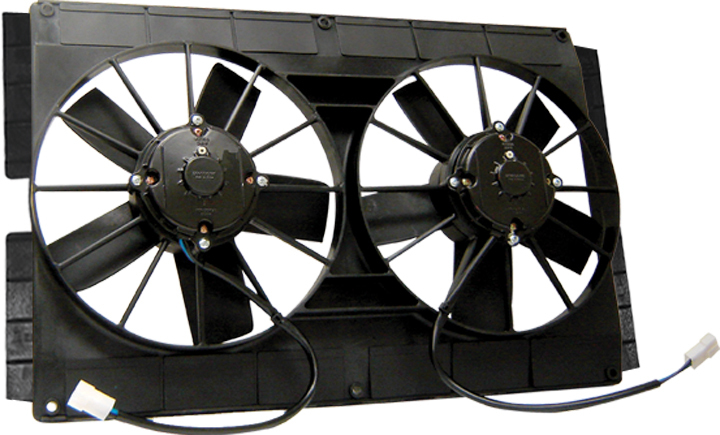 This is a high performance fan assembly and is sufficient for most intermediate and A/C applications. It has rubber flaps on the corners of the shroud to allow air to flow through the shroud when at high speed. An electric cooling fan or fans mounted on a fan shroud can solve multiple problems on a classic car or hot rod. An electric fan by itself will only pull air through the circle of the fan but if it is mounted on a shroud it will pull air through the entire surface of the radiator that is covered by the shroud. If water pump to radiator clearance is a problem, two fans on either side of the water pump pulley can be used to cool the engine properly. Electric fans can be controlled in a number of ways. We always recommend a relay type set-up to handle the high amperage that most electric fans draw. The relay can then be grounded by a coolant temperature switch mounted in the intake manifold or cylinder head, a toggle switch, an A/C pressure switch or a computer signal. You need to be sure that the relay is rated to handle the amperage draw of the fan you are using. When running dual fans it is recommended that dual relays are used. Both relays and fans can be controlled by the same signal method.